Chelsea Manager Antonio Conte has been fined £8,000 after admitting a Football Assoiation misconduct charge following his sending-off against Swansea. 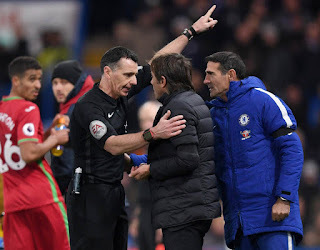 The Chelsea coach was sent to the stands by the officiating referee Neil Swarbrick towards the end of the first half in Chelsea's 1-0 victory after furiously protesting against the wasting of time by the Swansea players. Conte later apologized to the Ref and fourth official Lee Mason after the match. The FA announced: "Chelsea manager Antonio Conte has been fined £8,000 after he admitted an FA misconduct charge and accepted the standard penalty. "It follows his sending-off against Swansea City on 29 November."